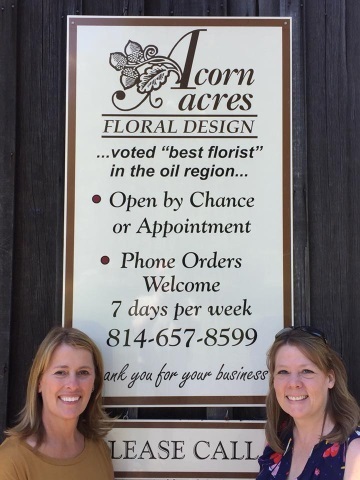 At Acorn Acres Floral Design, we proudly serve our city and surrounding area with the warmth and friendliness we all enjoy! We’re a local Titusville, Pennsylvania florist with over 20 years of floral design experience and a lovely variety of fresh flowers, custom silk and dried arrangements, and handmade twig and fresh pine wreaths. We hope you enjoy your online shopping experience with secure 24-hour ordering right at your fingertips. If preferred, you may call us to place orders direct at (814) 657-8599. We feature home consultations on custom floral designs. It is our pleasure to assist you with any local, as well as worldwide deliveries and remember that corporate accounts are always welcome. Call in to receive same day delivery to all area funeral homes and hospitals. Treat yourself or a special friend to one of our totally decorated mixed pine wreaths. Our wreaths are constructed of freshly trimmed blue spruce, white pine, red pine, fir and juniper from the forests of Northwestern Pennsylvania. The mixture of greens gives our wreaths a beautiful texture and color as well as a wonderful fragrance. If sending a wreath as a gift, we will enclose a handwritten gift card with your personal greeting. 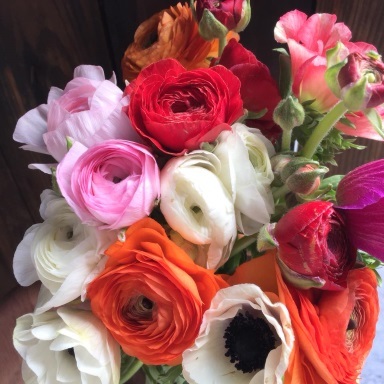 When It’s Time to Plan a Wedding, Party or Special Event… Let Acorn Acres Floral Design handle all the flower arrangements and on-site decorating. Call us in advance and schedule a consultation, so we can help you start planning your next unforgettable event! Call our shop and speak with our courteous and knowledgeable staff. We’ll deliver your preferred flower arrangement or live plant that will express your sympathy to the grieving family and celebrate the life of the deceased. When It's Time to Shop for Gifts that WOW them... We have these great items to choose from and more: Variety of Green & Blooming Plants, Fruit & Gourmet Baskets, Baby Gifts, Candy & Chocolates, Home Décor, Scented Candles, Silk & Dried Flower Arrangements, Handmade Twig & Fresh Pine Wreaths and Plush Stuffed Animals. Thank you for visiting our website with flowers delivered fresh from your local Titusville, PA flower shop, Acorn Acres Floral Design & Wreaths.